The Veterinarian who is treating Orion is a great man. He is a man of compassion. He is a genius. He performs miracles. His little clinic in Cali is famous in the country of Colombia. He is known for saving dogs from injuries no one else will touch. He is truly a miracle worker. My dog Orion is a patient and the care he is receiving is exceptional. When I enter the clinic I see misfits, animals that look like they have survived a war. 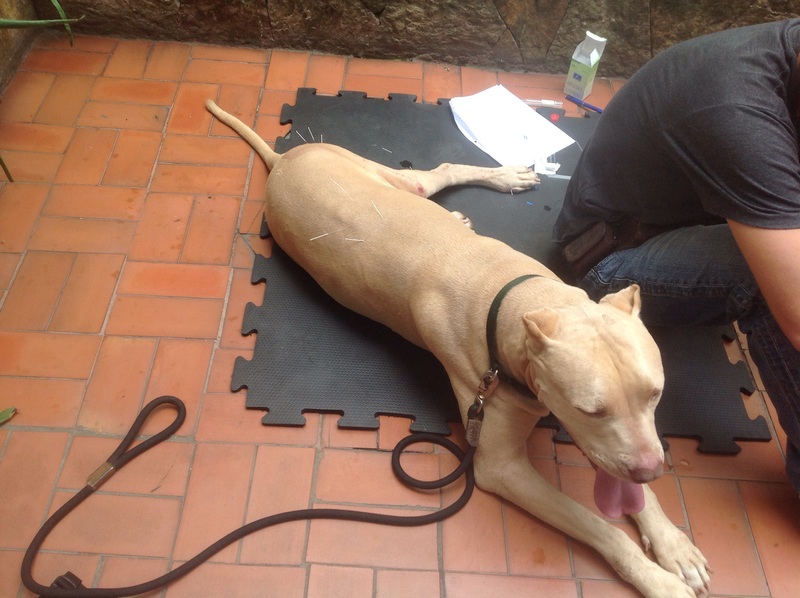 They are all around, resting on little mats after undergoing surgery, on leashes held by their owners, getting therapy in the exam rooms, or being seen by the doctor. Shaved body parts, casts, and limping are normal in this veterinary office.This clinic is not fancy. In fact it is a bit outdated. One would think walking into this office that it was nothing. I did. However, then I started talking with the people who are sitting and waiting with their wounded animals. We all share one thing: love for our four-legged children. Orion is always scared when we arrive. He hates riding in the truck. He remembers when he broke his front paw that he had to stay in a kennel and he has never gotten over it. He pants, he is restless, he shakes, and he tries to get the muzzle off that we put on him. Orion is a Dogo Argentino, a class of dog required to be muzzled. He doesn’t need to be. He is gentle and timid. He wags his tail even when scared. He allows everyone to poke and prod him, but he is so un-nerved. Orion pants and pants. Water is given to him when in therapy which he laps up. My heart breaks as I look around. There in a corner is an amputee dog, crying out, just out of surgery. Another mat has an old Chow who has lost all its hair and has dementia, but the owners cannot let go, a mini-Schnauzer with a cast on its front leg, an older Retriever with an injury on the front leg, a chocolate Lab walking pretty well on a broken leg the same as Orion which gives me hope. The little street animals brought in by compassionate people. A girl drove three hours with a puppy that had a crooked back leg. She was a street dog, probably hit by a car. This girl is a hero to me. She can’t keep the dog but is paying to have her leg fixed. She said to me she will find her a home. The dog will need to come back to see the doctor after surgery. She is willing to do this. I know there are really good people in the world when I see this sort of compassion. 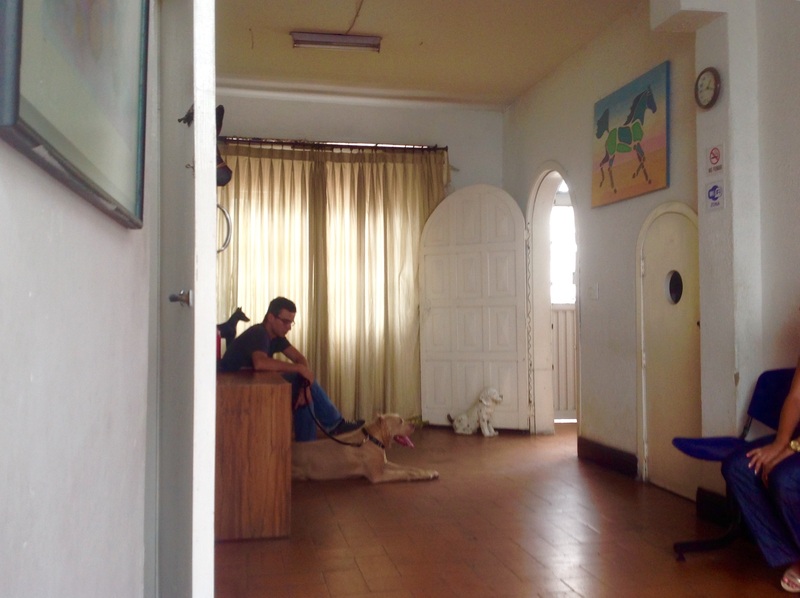 I have made many friends in this little veterinary clinic. We all talk about our dogs when we see each other. We wait patiently for our turn with the therapists, and we share our war stories. Dogs bark and whine as we talk over them. We describe our dogs accomplishments since our last visit. We watch as someone new enters with an injured animal knowing all too well the journey they will be starting. First the surgery and then the recovery. We all share a common bond, a love for our four-legged child who has been horribly injured. A bell rings and Orion’s name is called. It is his turn for Acupuncture. He is drooling from nervousness. We calm him with kisses and pats. He patiently lets the doctor stick needles in him. He gets heat therapy on his bad leg, then he has to lay calmly and wait a while. Orion is ready to go and he gets up and puts weight on his leg immediately after his treatment. Not a lot, but enough to let me know he will be walking normally soon. My heart is happy. We have seen Orion go from depressed with rods in his leg and a cast on the thigh, to now being able to get around quite well. He is back to his sunny disposition as soon as we settle in the car for our hour ride back home. Orion drops his head for a much needed snooze. He knows it is over for now. He can relax. When we arrive at the farm, he is greeted by his pack. They all sniff him and the strange smells he carries from the veterinary office. 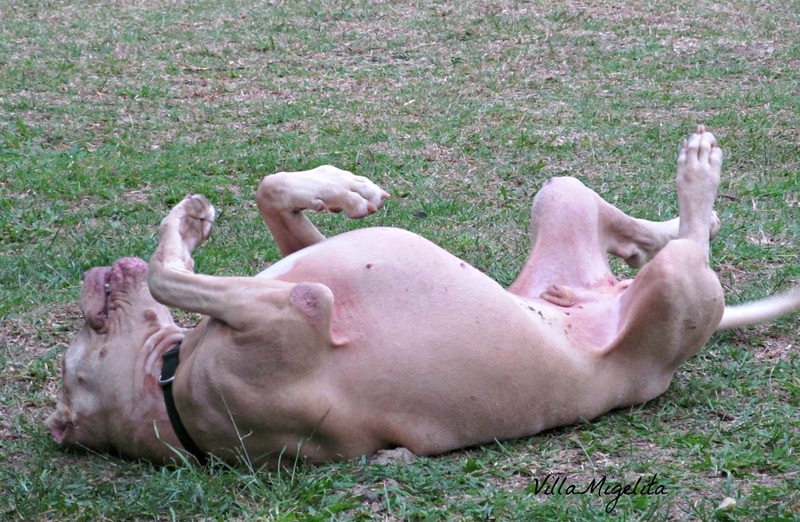 Orion goes and stretches out on the grass. He rolls with delight at surviving another visit with the vet, and soaks up the sun. Life is good.